This is the fourth-part of a six-part report. Part one can be viewed here, part two here, three here. 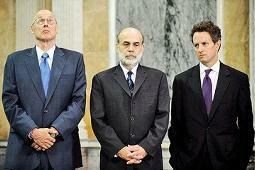 The bailout was a financial coup, an intelligence operation to seize control of the US economy and tax system. It is similar to what the Economic Elite have done through the International Monetary Fund (IMF) in many other countries throughout the world. It is clearly a case of economic imperialism. When financial coups are carried out in other countries, they call it aStructural Adjustment Program (SAP). The end result is the theft of working class wealth, the privatization of public functions and resources, rising unemployment, the elimination of the middle class and increasing taxation and debt that turns the overwhelming majority of the nation into a peasant class. This is exactly the track we are on now. Paulson quickly brought in several former Goldman Sachs partners to help him engineer the coup. A pivotal Paulson asset was former Goldman executive Dan Jester, who Paulson quickly hired as a “contractor.” As Robert E. Prasch recently reported, “Jester was never appointed by Congress or otherwise vetted before taking up his role as the Treasury’s de facto central player in the crucial decisions that marked that fall’s bailout of Wall Street.” Paulson’s most publicized move was the $700 billion Troubled Assets Relief Program (TARP). This was a blatant no-strings attached giveaway of taxpayer money, handed directly to Wall Street’s biggest players. To oversee the TARP operation, Paulson brought in Goldman Sachs Vice PresidentNeel Kashkari. The assassinations of Goldman rivals Bear Stearns and Lehman Brothers, and the forced Bank of America acquisition of Merrill Lynch were all equally scandalous actions as well. The hidden hand of the Bernanke-led Federal Reserve’s secret “black magic” tactics — which created and distributed trillions of dollars — turned Morgan Stanley and Goldman Sachs into bank holding companies overnight, which gave them access to trillions of dollars to furthermanipulate the market and create record setting profits. Through the crisis, the fundamental structure of the stock market has been proven to be a scam. The Ponzi scheme activities, outright market manipulation and massive worldwide fraudperpetrated by Goldman Sachs, JP Morgan, Morgan Stanley, Citigroup, AIG, the three major ratings agencies and several other Wall Street elite firms are blatant. Just in the housing andoil futures markets alone, the criminal activity and economic theft is in the multi-trillions. Obama clearly has not held the thieves accountable. He has emboldened them in ways that led to record setting profits and bonuses – bonuses that are 100% a direct result of our tax money. He let them take the money, keep the money, and now he lets them continue to makeeven more money. And now that Obama has given trillions of our dollars to Wall Street, he is all of a sudden soconcerned about our national deficit. That is disgraceful! When it came to the Economic Elite he could give away trillions, but when it comes to the social infrastructure of the American public and creating job programs, we all of a sudden have to be tight with our tax money and make “painful choices.” When looking at Obama’s latest $100 billion jobs program, again, compare that to the $150 billion in bonuses. If you want to know if Obama is serious about creating jobs, just look at where he gave his big “ Jobs Speech” – at the Business Roundtable affiliated Brookings Institution. Thus again, confirming where his true loyalties lie.